This article was first published on Talk Magazine Shanghai 2014 December edition. As a financial advisor, at times, I will assist clients in determining whether certain financial decisions make sense. Deciding on whether to leave a well paying job to go back to school to obtain a Masters in Business Administration is not a decision to be taken lightly. If you’re considering an MBA, you face two questions: Is the degree worth it? How will I actually pay for it? These are important questions because so many people consider pursuing an MBA to advance their careers. But an MBA isn’t an automatic ticket to success, and it carries a high price. According to Forbes, the median total tuition over two years for a full-time MBA at a top-10 US school is $119500, based on the 2013 school year. The median total two year tuition range among the remainder of the top 70 schools on Forbes’s list was $78000. Besides tuition, you should also factor in the opportunity cost of forgoing two years of salary and possible missed career advancement. If your current salary is already over $100000, attending a lower tier school is unlikely to be financially justified. • You will get a lot of personal satisfaction from the education you receive An MBA is probably worth the cost if you get into a top-tier school, and one or more of these three conditions apply. Relationships from one of the top-tier schools can be incredibly valuable. A degree from a top-tier school, such as Harvard, Stanford, Wharton, London Business School, or INSEAD will open doors and will likely get you an interview almost anywhere. The education is also arguably better because the top schools are able to attract the best professors. The difference in earnings over a 20-year period between a top-tier MBA and one from another business school is around $1 million, based on a recent study by Bu sinessweek. The difference indicates how valuable a top B-school is. The schools’ names and known selection criteria get their graduates more and better interviews, and the elite networks may be even more valuable. The value of an MBA is much less clear the lower down the rankings you go. The median starting salary for US MBA graduates was only $85000, according to a recent study. Graduates from the top 10 schools earned a median starting salary of $120000 in 2013. When you factor in starting bonuses, the top schools were even farther ahead. 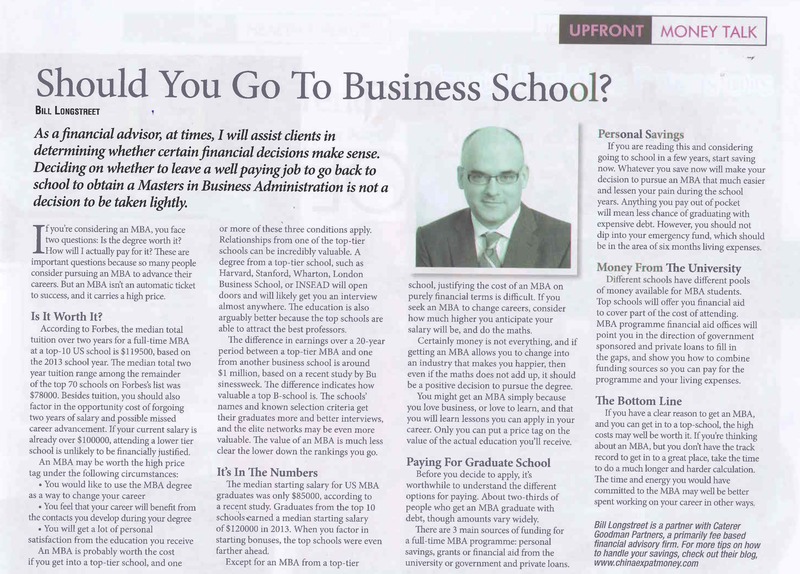 Except for an MBA from a top-tie school, justifying the cost of an MBA on purely financial terms is difficult. If you seek an MBA to change careers, consider how much higher you anticipate your salary will be, and do the maths. Certainly money is not everything, and if getting an MBA allows you to change into an industry that makes you happier, then even if the maths does not add up, it should be a positive decision to pursue the degree. You might get an MBA simply because you love business, or love to learn, and that you will learn lessons you can apply in your career. Only you can put a price tag on the value of the actual education you’ll receive. Paying For Graduate School Before you decide to apply, it’s worthwhile to understand the different options for paying. About two-thirds of people who get an MBA graduate with debt, though amounts vary widely. There are 3 main sources of funding for a full-time MBA programme: personal savings, grants or financial aid from the university or government and private loans. If you are reading this and considering going to school in a few years, start saving now. Whatever you save now will make your decision to pursue an MBA that much easier and lessen your pain during the school years. Anything you pay out of pocket will mean less chance of graduating with expensive debt. However, you should not dip into your emergency fund, which should be in the area of six months living expenses. Different schools have different pools of money available for MBA students. Top schools will offer you financial aid to cover part of the cost of attending. MBA programme financial aid offices will point you in the direction of government sponsored and private loans to fill in the gaps, and show you how to combine funding sources so you can pay for the programme and your living expenses. If you have a clear reason to get an MBA,and you can get in to a top-school, the high costs may well be worth it. If you’re thinking about an MBA, but you don’t have the track record to get in to a great place, take the time to do a much longer and harder calculation. The time and energy you would have committed to the MBA may well be better spent working on your career in other ways.